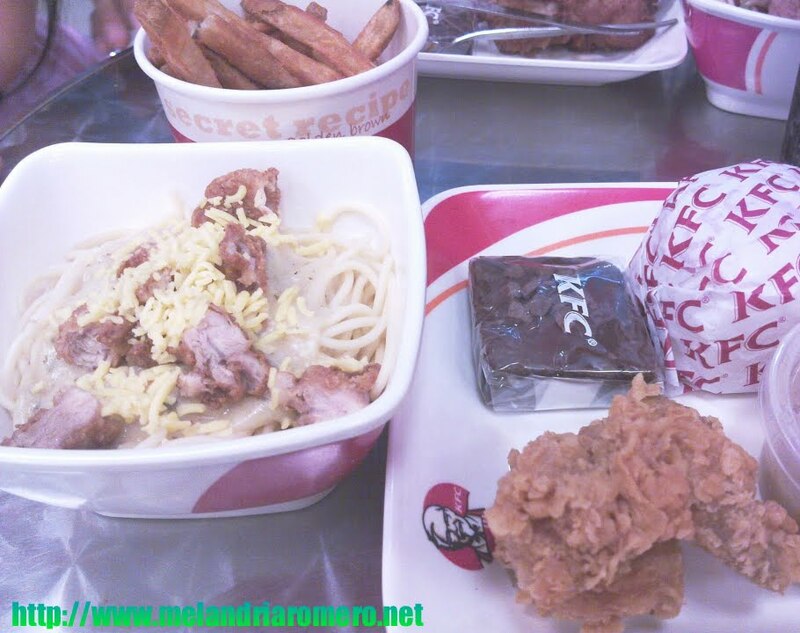 Just this afternoon i have posted about KFC Pasta Bowl and my winnings for the KFC Pasta Bowl 100 ways application. Later this evening, we went to SM with our darling Peachy and decided to take our early dinner at KFC and ordered a fully loaded meal with pasta bowl. Just to correct my recent post, Pasta Bowl has three varieties, the creamy tomato, pasta alfredo and kung pao chicken. Just as usual, I ordered Pasta Alfredo and I ordered a Kung Pao chicken for hubby and did you remember the bucket fries? I just can't wait to be one of the many people who have already tried this pasta and giving their highest praises. In other words, I don't want to be left behind on the newest sensation that hits the town. It has a nice presentation and the ingredients were made from a good quality of pasta. It was nicely cook, meaning it is not very tender. The ingredients/chicken were really yummy and the sauce was quite enough for the whole serving and it was also very affordable. I believe that the sauce was sweet and spicy sauce with bits of their famous chicken and peanuts on top. Although I am not a big fan of sweet and spicy pastas) I would say that the flavor of it is not really very unique from some Sweet and Spicy pasta that I have tried from the past. 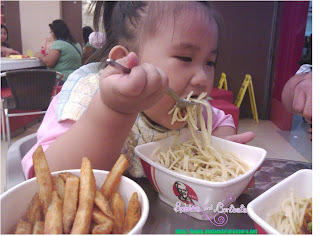 And the one who truly enjoy her meal is our little Darling Peachy. Surely,we will be coming back again to buy the new Pasta Bowl.